Less than one year after the closing ceremony of Autumn Agora-Zaragoza took place in Palacio de Congresos in the capital of Aragón, another important AEGEE event is approaching in Zaragoza. Combining the expertise of “oldies” together with the motivation of the “newbies” AEGEE-Zaragoza is taking up the challenge of hosting the Autumn Network Meeting (NWM) Zaragoza 2014. As announced recently, Carmen Maria has become the NetCom assistant of the area of “La Nave” (antennae in France, Portugal, Spain and also the one in Brussels) and one of her first tasks is helping with the coordination of the Autumn NWM that will take place in Zaragoza, most probably this November (dates not confirmed yet). Many times, after hosting a large statutory event, antenna experience the activity level dropping, since this is usually the time when the older generation decides to leave AEGEE. AEGEE-Zaragoza is still a strong antenna organizing a wide range of local activities, and since the Agora it has organized a Local Training Course and a yearly social event, usually referred to as “Maños”, and now the next event on the list is the Network Meeting. The AEGEEan interviewed PR responsible of the NWM Carlos Embid about the team, the motivation, keeping members active, collaborating with the Network Commission (NetCom) and more. The AEGEEan: Why did you decide to apply to host the Autumn NWM? Carlos: We felt that after organizing ZarAGORA the new and passive members became active and, as it usually happens after events in the association, AEGEE-Zaragoza grew in terms of not only more active members but of course also experience in hosting events. Concretely, some of the new members of AEGEE-Zaragoza couldn’t go to the Spring NWM Alicante 2014 for different reasons, so after being informed by Pablo Ruiz about the application period for the NWM, some of them proposed to apply for the autumn NWM, and the “oldies” of AEGEE-Zaragoza encouraged them to complete this new objective: prepare the application. After that, the first goal was to get selected to host the NWM. The second is to make the NWM the best network meeting ever thanks to the volunteers who have already started with the organization of the event. So that’s why it is an interesting new challenge for AEGEE-Zaragoza to be the host of the Autumn Network Meeting 2014, working closely with the Network Commission. We truly appreciate the opportunity given by the NetCom to realize our idea of the NWM and to work once again together for another great event. The AEGEEan: How will it help that you have Pablo Ruiz who is a subcommie of “La Tripulación” (The team with the Network Commissioner of “La Nave” and his/her subcommissioners ed.) 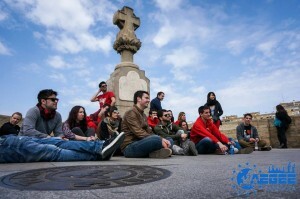 and a member of AEGEE-Zaragoza? Carlos: He’s actually one of the most important people in AEGEE-Zaragoza, working hard for AEGEE from several levels. He’s a real AEGEEan and as such, he is helping the new members all the time. After Pablo, who knew of our intentions, told us to apply for the NWM, he came to us and he said “I can’t believe that you want to do it”, so I think that he couldn’t believe how active AEGEE-Zaragoza wants to be. Fortunately has been helping us, as if he were an organizer, from the beginning.We know that if we have some problem, we can just take the telephone and call him. While we were working on the application and also after we knew the results, he told us that he will be there if we need help, or to solve any problem. Also, as we are from the same antenna it is quite easy, we can meet on the street, or in the bar, at the university. Also, speaking Spanish helps us avoid some misunderstandings, and the speed of his answers is very important. The AEGEEan: What are your plans for the NWM? Carlos: First of all, to organize the best NWM in history. 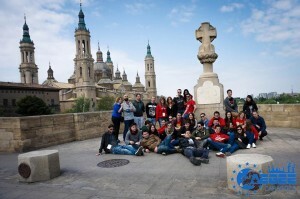 With AEGEE-Zaragoza you never know what to expect, we learned to work in secret… just kidding. We have some objectives that we have to accomplish. First, we want to create an entertaining program, that would be complete and go beyond the typical expectations of a NWM. We want the people to think that coming to the NWM will be worth it and will solve their doubts. It’s about coming to a NWM where the speakers feel comfortable and can explain everything with confidence, and where every attendee learns about our Network and where they can have their doubts dissolved, a place where you can surely feel AEGEE spirit. The main thing is that the NWM has to be useful and an ideal formative event, where doing a workshop is easy and where people have all necessary equipment. We want to look for a quality place, with adequate temperature, with good lighting and where people want to learn easily. The antennae will be our guests and we want the best for our guests. We will prepare a very interactive social program in which teambuilding will be the main focus point. With it, we would like to encourage the rest of the antennae to be more and more participative in organizing European events. To sum up, we want everybody to think that it was the best NWM in AEGEE’s history. The AEGEEan: Does it help that you have recently organized the Agora, a Local Training Course and Maños? Carlos: Undoubtedly yes. Maybe hosting the Agora contributed with more energy. After it, many people got really involved and some of our new members dared to travel, managing weekly activities and bringing us incredible energy or just participating and making our meetings more colorful. About the Local Training Course, it was in nature. We were in a town called Borja, the Ecce Homo (the famous painting “restored” by an amateur painter ed.) place, and the workshops were interesting and funny at the same time. Furthermore, we managed to do a lot of activities in 24 hours and took advantage of our time without stopping at any moment and the people liked it, so they became more and more active afterwards. The AEGEEan: Who will be part of the organization team? Carlos: Really we have a great and well connected group. 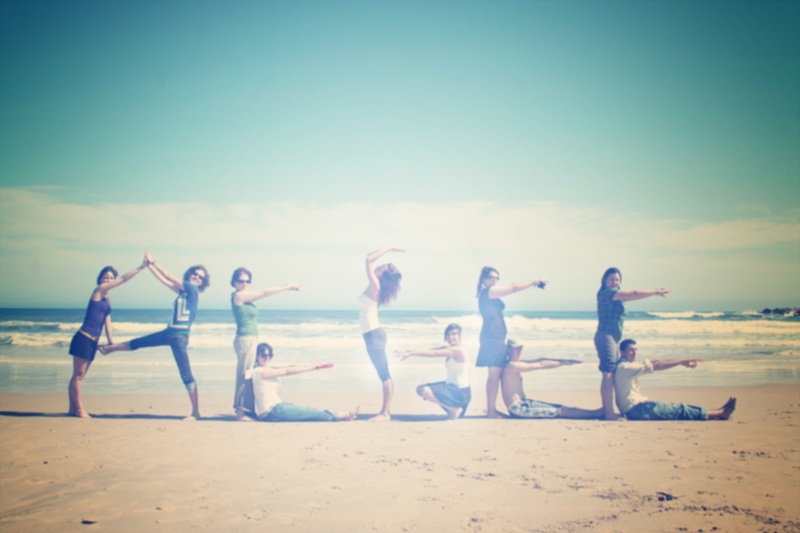 We belong to the same generation, and we work actually in many activities and programs together. Almost every week, we are together in our reunions or in private meeting having a picnic, or coffees, studying, etc. Another good point about it is that we come from different fields of professional life, such as future lawyers, nurses, doctors, programmers, engineers… so we can share our knowledge to do a better job. Our structured work is really simple: we are in contact all the time and we take all the decisions together. Thereby, the whole group is responsible of our actions, and we are trying to do the best for the event. Even if some special task needs a lot of time, such as looking for the best accommodation for participants, we are together just as one body, one voice. Silvia Sierra is the main coordinator and the actual secretary of our antenna. But she’s not alone, she has the best team she could ever have: Carlos Embid – PR, Sara Urdaniz – social program responsible, Juan Valles – incoming responsible, Alejandra Pérez – logistics responsible, Raúl Lapeña – meals responsible, Ava Rasekh – treasurer, and Ander Guerrero – Fundraising. The AEGEEan: You organize many events in your antenna, how do you make it all possible? Carlos: The point that we have to highlight is the organisation. We explain each week in our reunion how every activity or travel is going, we do weekly evaluations. There are also individual decisions taken by the leader, which are respected and he/she is the go-to-person with solutions to potential problems. This year we worked very hard, and the system is really good. We don’t have any secrets just work, communication, consensus and decision. The AEGEEan: You also recently won two The AEGEEans Choice Awards. One of them was once again for Best Merchandise. Are you working or will you work on any new merchandise for the NWM? Carlos: Actually, we stopped some programs because of the exams, but we plan some possible programs, and maybe we will totally modify our merchandise or we will just do a few changes. We have not chosen anything. I can’t tell you more about it at the moment, but I will keep you informed. However, I think that in the next meeting we will make a decision, and we hope that it will have the success of the Agora merchandise.